The great benefit of laminate flooring is it is a beautiful look, has great durability and the installation can be a money saving process. It wears well, is easy to maintain and is scratch resistant, stain resistant and impact resistant. It is great in a busy household of children, pets and spills. We need to understand that laminate floors are not real wood or tile. They are a wood look or a tile look. It is actually a picture of a wood or tile pattern and then has wear layers on top and compressed onto a board product which when all finished is a very durable and beautiful product. With this product you get what you pay for. A cheap product will not stand up to the characteristics listed here. It is well worth it for you to spend a few extra pennies and have along lasting product. We carry 3 of the top brands for a very good reason. 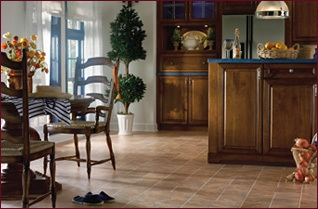 (631) 470-3544 or email to set up your free laminate flooring appointment and personal consultaion. ©2015 Floors Decors and More, Inc. All Rights Reserved.